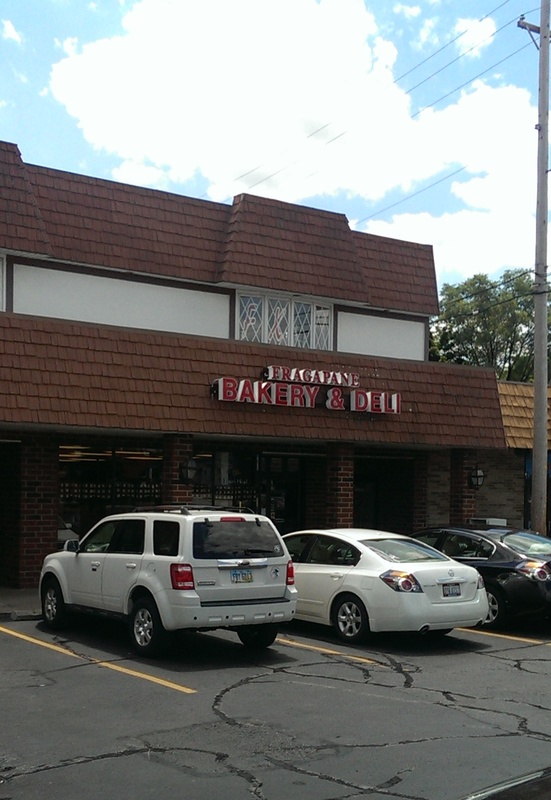 When I want the best potato salad in Cleveland I drive to Fragapane’s Bakery & Deli on Lorain Road in North Olmsted. The location in Bay Village is their flagship store. The family bakery, which began in 1971 when brothers Nick and John Fragapane opened their doors in Bay Village. They also used to have a storefront in Olmsted Falls, but it closed. This family-owned bakery and deli is a West Side staple. Every birthday and graduation party I attended growing up had a big bowl of Fragapane potato salad. Their paczki sell out on Fat Tuesday and are ordered weeks in advance (they make them one day a year). 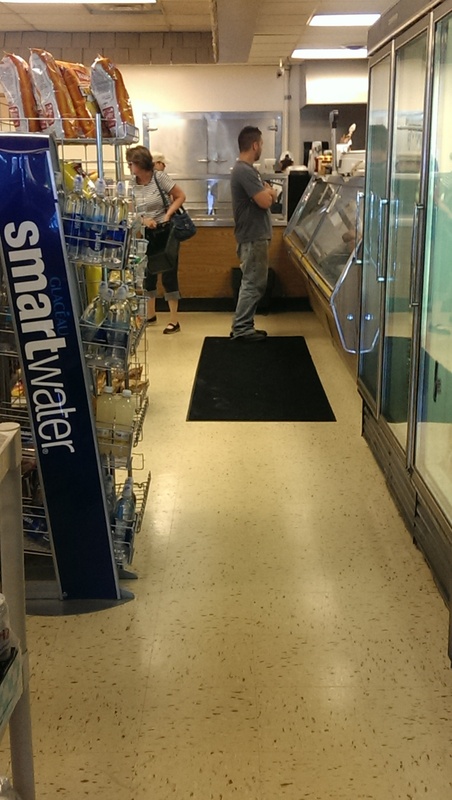 I drive from Cleveland Heights to buy a pound or two of potato salad. In fact, this is the ONLY place we will buy potato salad or I make my own, using my mother’s recipe of half sour cream/half mayo. Fragapane’s potato salad features slivers of carrot, onion and celery, and is a mayo-based potato salad. It’s not too sweet and is very smooth. It is simply delicious and very addictive. I have learned that if I need this for an event I need to call and order it ahead of time to ensure they have set some aside for me. I have driven over several times only to be disappointed that they have sold out. Their deli subs and sandwiches are amazing. They come with one meat or three-meat combos for $5.99 with a choice of mayo, mustard, horseradish, lettuce, tomato, onion, and your choice of cheese. Th e subs are made with Boars Head meats, which are all natural and one of the best lunch meats out there. These suckers are stuffed full. 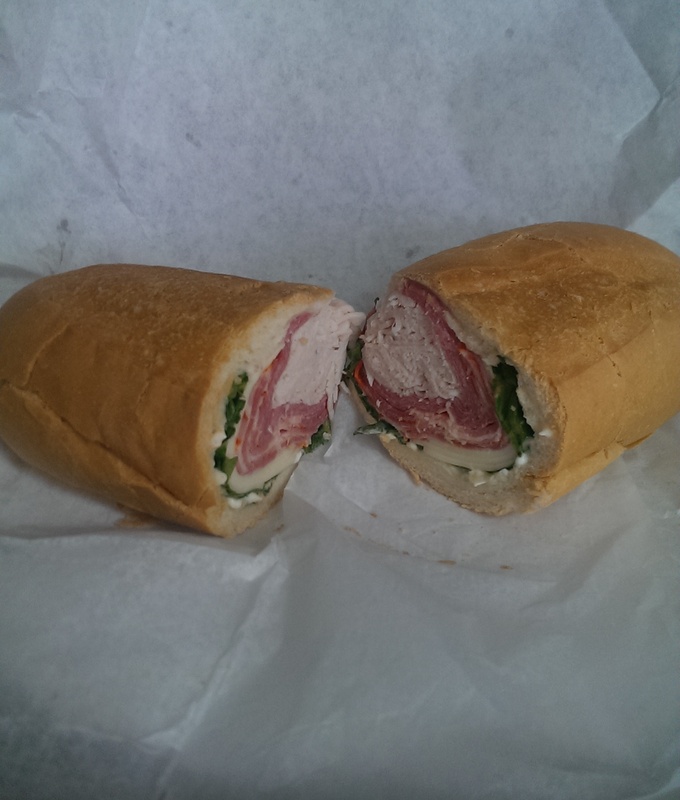 My favorite is the Fragabomb (to the right), which features ham, turkey and spicy capicola and provolone cheese. 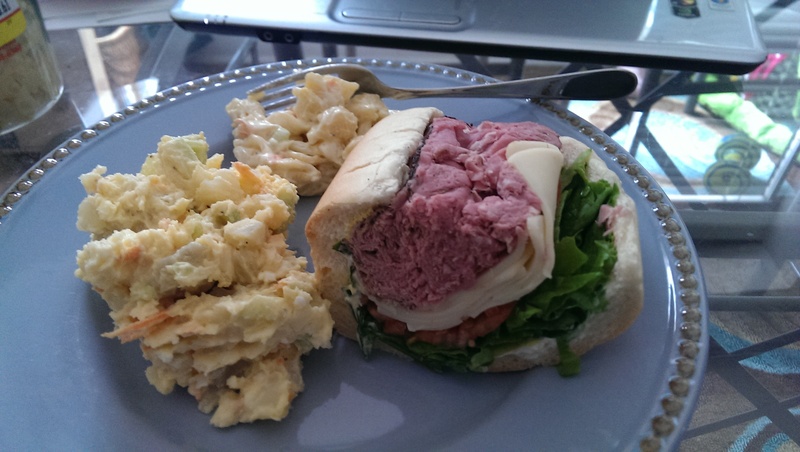 The photo at the bottom is half of a roast beef sub with Swiss cheese as well as a healthy portion of potato salad and a smaller portion of the pasta salad at the top of the plate. I also buy the mayo-based pasta salad, but (word of warning) it is a very sweet pasta salad. It is made with mini shell pasta and also contains carrots, onion and celery. I usually toss in a can of tuna and some frozen peas and make a light summer pasta salad with it. Others swear by the pizza slices, smokies, tuna salad, crab salad, antipasti salad, etc. They feature a daily lunch special that sells out quickly. This place is very popular with local workers. I don’t necessarily go there for their baked goods, so I can’t really say anything about them. I had a custard-filled doughnut there once. It was jammed with custard and very heavy to lift. Unfortunately it also seemed a little undercooked. The eclairs there are always favorites for dessert trays. I’ve seen mixed reviews online. I did, however, pick up a couple cans of fire-roasted diced tomatoes and tomato sauce to make some unstuffed cabbage rolls tonight. They have several small rows of Italian staples like pasta, pickled vegetables, olives, etc. It saved me a trip to the grocery store! The staff there is always friendly and helpful. One time when they were out of potato salad the woman waiting on me called the Bay Village store to see if they had any left. Unfortunately they did not, but I appreciated that she made an effort to find out for me.